In semi-crystalline polymers, a range of morphologies can be obtained in which a chain may traverse the amorphous region between the crystals or fold back into the crystals leading to adjacent or non-adjacent re-entry, depending on the molecular architecture and crystallization conditions. This causes topological variations on the crystal surface and the occurrence of an interphase between the crystalline and amorphous domains, thus affecting the mechanical properties. In this chapter, we will discuss how the morphology within the interphase plays a prominent role in drawability, lamellar thickening and melting of thus crystallized samples. 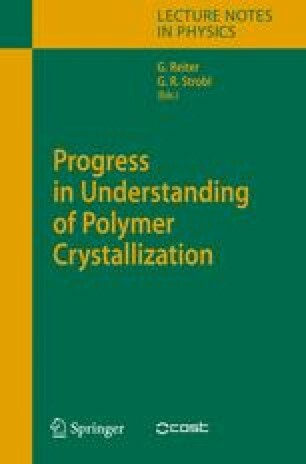 Normally, for linear polymers it is anticipated that extended chain crystals are thermodynamically most favorable, and ultimately, taking the example of linear polyethylene, it is shown that such chains would form extended chain crystals. However, this condition will not be realized in a range of polymers upon crystallization from the melt, such as those which do not show lamellar thickening or in branched polymers where the side branches cannot be incorporated within the crystal and hence fully extended chains are not possible. From a series of experiments, it is shown that with sufficient time and chain mobility, although extended chain crystals are not achievable, the chains still disentangle and a thermodynamically stable morphology is formed with a disentangled crystallizable interphase. The disentangled interphase has implications in the melting behavior of polymer crystals. It is feasible to melt these crystals by simple consecutive detachment of chain segments from the crystalline substrate. Clear distinction in different melting processes is observed, by the differences in the activation energies required for the consecutive detachment of chain segments or clusters of chain segments. The differences in the melting behavior, revealed during different heating rates, have consequences on the chain dynamics.